Gallup’s Ashley Antone guards Kirtland Central’s Monique Shim on Friday night during the District 1-4A championship. The Kirtland Central High School girls’ basketball team has no intention of sharing anything this season. They made their point clear over the weekend when they defeated Gallup High School 46-38 for the 1-4A district tournament title. Kirtland Central head coach Devon Manning said his team was adamant to keep what they believed to be theirs. It was the outcome the Lady Broncos knew they wanted, but one they also knew they would have to fight for. 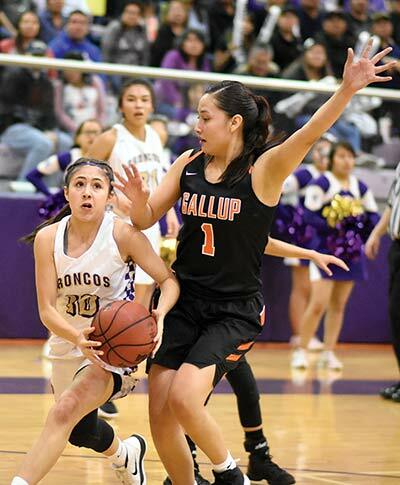 The Broncos went into the game swinging, getting two baskets in to lead 4-0, but Gallup didn’t allow them to get too far ahead, keeping a step behind the Lady Broncos. Kirtland Central led 13-12 after one quarter. With their zone defense, Gallup found a way to distance themselves from the Lady Broncos, and made a 5-0 run to lead 17-13. With one basket, Kirtland was one step behind. The two tied the game up a number of times before Kirtland sunk a three-point basket just before the break to lead 22-19 at the half. Manning said he expected nothing less from the Lady Bengals, especially in the early part of the game. Knowing that Gallup had made some adjustments to its defense in preparation for the game, Kirtland Central made some of its own going into the second half. The two teams battled defensively for most of the third quarter before Kirtland Central was able to overcome the defense Gallup gave them. Kirtland Central had the 30-27 lead before going on a 6-3 run to end the third quarter. The Lady Broncos led 36-29 after three quarters. Manning said his team made a key point in the game.